The perfect way to bring colour to your garden, whether in borders or containers. Pink Fairy Lilies will explode into life this summer with an incredible display of bright pink blooms. They are perfect for adding vibrant colour to beds and borders, or patio pots. Each pretty, six-petalled flower is a beautiful bright pink, with contrasting yellow stamens! Perfect for scattering in grassy areas or under trees. Plant them about 5cm (2') deep. 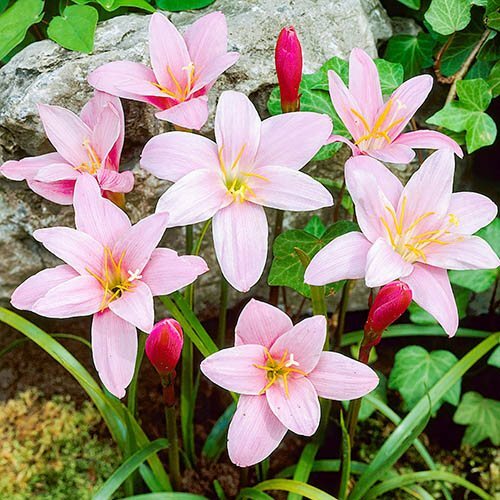 A relative of the amaryllis, Zephyranthes, (or to give them their lovelier name, Pink Fairy Lilies), will explode into life this summer with an incredible display of bright pink blooms. They are perfect for adding vibrant colour to beds and borders, or patio pots. They are perfect for adding vibrant colour to beds and borders, or to patio pots, they're easy to grow and maintain, just plant them where you want and let them get on with it! Naturalising in the garden, they return year after year in a blaze of colour - each pretty, six-petalled flower is a beautiful bright pink, with wonderfully contrasting yellow stamens! Supplied as a pack of 25 bulbs, they're perfect for scattering in grassy areas or under trees. Plant them about 5cm (2in) deep. Rain lilies are happiest with little water during spring and summer, with a bit more water late in the season to trigger flowering. Plant the bulbs immediately on receipt. Dig holes and plant the bulbs 5cm (2in) deep and 8-10cm (3-4in) apart. After planting, water well, gently soaking the soil and settling it around the bulbs. Flowers are produced in late summer. After blooming has finished for the season leave the foliage in place to allow the bulbs to store energy for their winter dormancy. Leaves will yellow and die back in the autumn when they can then be removed.